Kroger Weekly Flyer February 6 - February 12, 2019. Fresh Food. Low Prices! 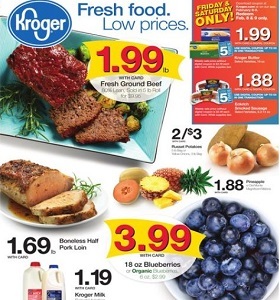 Kroger Weekly Flyer February 6 – February 12, 2019. Fresh Food. Low Prices! -20% off Everyday Living Kitchen Gadgets; $10.49 Ferrero Rocher Diamond Gift Box. To see the weekly circular for your favorite Kroger store, search by ZIP Code or city, state.